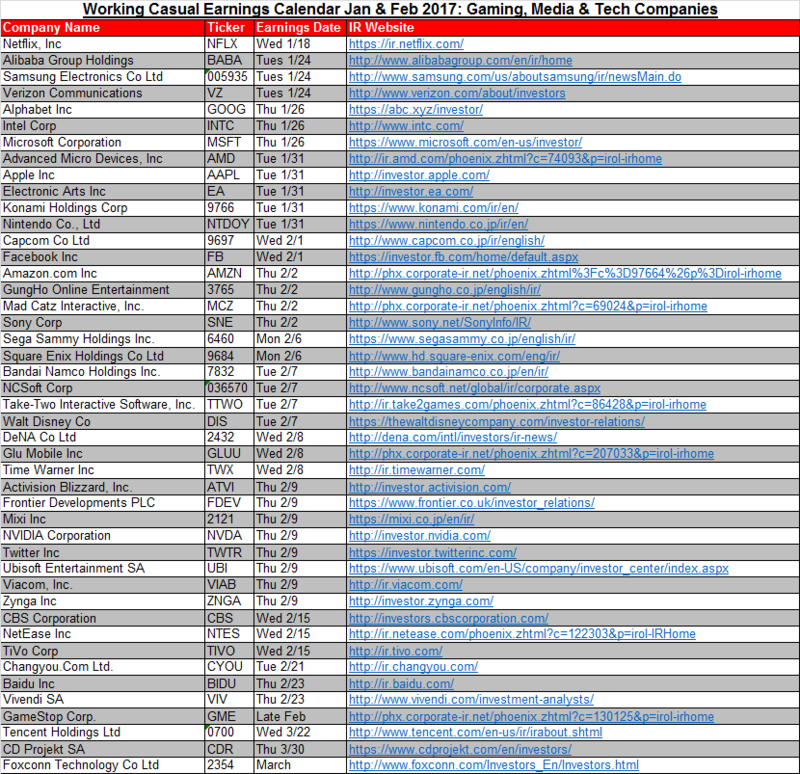 Here we have the first “earnings season” of 2017 for gaming, media and technology stocks, and just like last quarter, I’m right here to map out the schedule so you can keep up-to-date with all sorts of fun, interesting financial results. Why else would you be here! As usual, above I’ve compiled a list of numerous companies that are reporting results this quarter. Since it’s the beginning of a new year, some will even report full-year figures from their latest fiscal years. Bonus content! A couple higlights include Nintendo $NTDOY having its first earnings meeting since formally revealing its newest console, the Nintendo Switch. Might hear some sales expectations if we’re lucky. This is also the first earnings release for Time Warner $TWX after announcing it will be acquired by AT&T $T. Might be some further guidance on this deal and its timetable, as it was one of the largest acquisitions announced in 2016. And lastly, we’ll see if Vivendi $VIV provides more information on its ownership stake in publisher Ubisoft Entertainment SA $UBI. At last count, Vivendi owned more than 25% of Ubisoft, which has pundits thinking a hostile takeover is fast-approaching. Before I go, note that a handful of companies like Alibaba, Netflix, Samsung and Verizon and have reported already earlier this month, so going forward I’ll shoot to have this article up a bit earlier. Apologies, but hey we’ve got plenty of earnings season left to enjoy. Let me know if you are looking forward to any resutls in particular, or if I missed any you might want to see on the list. Thanks! Will be interesting to see if Pres. Trump will allow the AT&T acquisition of TWC to go forward. We’ll see. Indeed. Such a massive deal that will impact a variety of industries, so the government will be taking a close look!